Dates: Arrival Wednesday afternoon, April 20, Please plan to arrive by 4 pm. Supper will be available at 6 pm. Orientation & instructions at 7 pm. Formal practice begins Wednesday evening and Noble Silence begins Thursday morning continuing through Monday morning. Departure Monday, April 25 at 1 pm. Location: At beautiful Manzanita Village, near Warner Springs, CA, N of San Diego & about 2 hours from LA. Maximum 20 Places Available: Small group size ensures personal attention and a more intimate retreat. 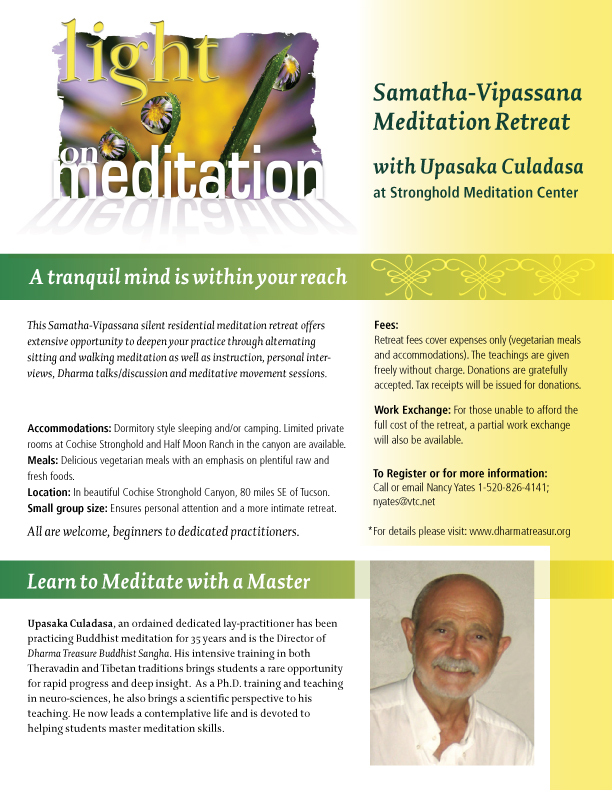 All are welcome, beginners to dedicated practitioners. Fees: $400. Retreat fees cover expenses only (vegetarian meals and accommodations) and do not support the teacher. Your donation will be gratefully accepted by the teacher and is tax-deductible. Tax receipts will be issued for donations. Partial Scholarships Available: Apply when registering. Registration: Confirmed with payment in full of retreat fees by Friday, April 15th. Impressive This really is one of the best web sites I’ve ever read on this subject. in defining sensations experienced in meditation and ordinary life.